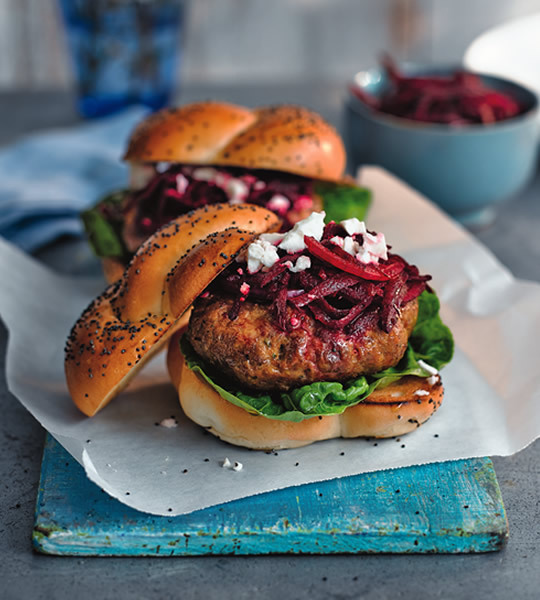 Featured in this month’s ocadolife magazine, our juicy lamb and chickpea burgers with beetroot slaw and feta are quick and easy to make. Feta and mint bring a touch of Mediterranean flavour, while the spicy harissa paste adds an extra kick. Tip the drained chickpeas, garlic, harissa and herbs into a food processor and blend until fairly smooth. Scrape into a bowl and add the lamb mince and egg. Season with salt and pepper and stir well until completely combined. Shape into 6 patties and grill for 3–4 mins on each side until cooked through. To make the slaw, place the onion slices in a bowl and sprinkle over the lemon juice. Add the remaining ingredients, toss together well and season with a little salt and pepper. Assemble the burger in a bun – soft white, seeded or ciabatta rolls will all work. Layer lettuce, sliced tomatoes and slaw as you wish, and crumble the feta over the top. This entry was posted in Talking Ocado and tagged Easter, Hamburger, lamb, lamb recipe, Recipes by Ocado. Bookmark the permalink.